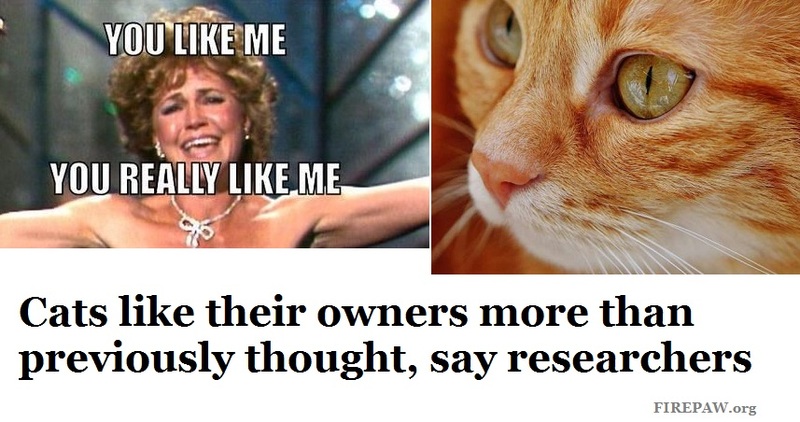 Cats may actually like their owners: New research – FIREPAW, Inc. They may have a strange way of showing it, but it turns out that cats may actually like humans far more than previously believed according to new research published in the journal Behavioral Processes. To assess the degree to which cats like (or are stimulated by) certain things, the researchers tested reactions from two groups of 19 cats each—those living with people and those living in a shelter. The cats were kept sequestered for two and a half hours and were then watched as they were presented with three items from one of four category types: food, scent, toy and human interaction. The researchers mixed up the stimuli for the different cats to get a better read on which they found the most stimulating. The degree of preference for any one stimulus was judged by which stimulus the cat went for first and how and for how long it interacted with it. The researchers report that they found clear variability among the cats regardless of home type, but overall social interaction with humans was the stimulus most preferred—half of the cats chose interacting with a human above anything else offered, which included food—they spent on average 65 percent of their time interacting with a person. This, the researchers suggest, shows that cats really do like being around their human owners, despite how they might behave around them.